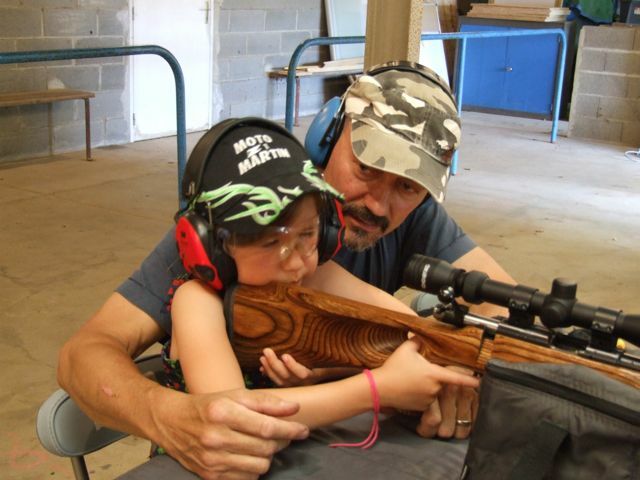 I went to the shooting club with my 7 year old daughter on Saturday. She was spotting the target for me while I practiced with my No8 rifle. Then she asked me if she could shoot it. So I decided it was a good time for here first .22 experience. Put the rifle resting on the kit bag; and set up for the 25 metre gongs. Got her comfortable and took some time to explain what she need's to see through the sights. The first shot dropped the gong! Super! missed the next four, then got 3 out of 5 in the second series of 5. Ended up with 5 gong's dropped for 15 shot's. 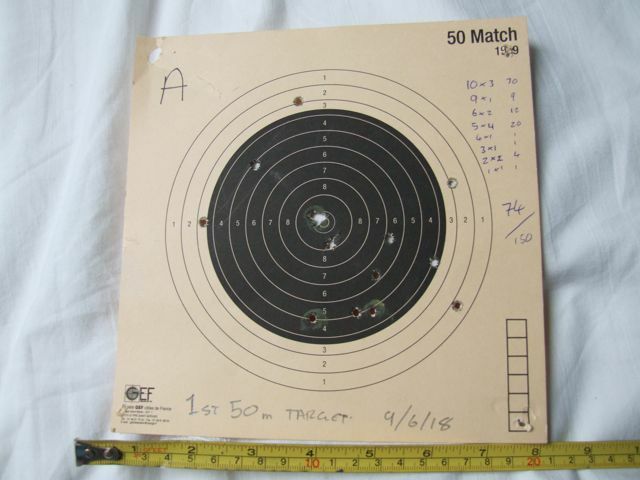 A great start; considering I'd left the sights at my 50 metre setting. She was really pleased; especially that important first shot. Next time I'll set up the second rifle for 25 metre's and bring the sand bag rest. Oohh careful there, soon it'll be "her rifle", not yours! "But Papa, I ALLWAYS use this one now! Well done! Keep the interest up! Luckily Shamu I have 2 No8's for just such a problem! It has the short stock as well; but I'll probably need to find a "bantam" stock for the No8, which may be difficult. nice to see her wearing ear defenders, as well. We always wear ear defenders at the club. She is wearing my new ones with built microphone so she can hear what I'm saying. Vitally important when teaching a youngster to shoot. She's been coming to the range since she was 2 years old and knows the rules. So this last weekend we went shooting as a family. Alexandra was keen to have another go. Took along my only none Enfield rifle; it's a CZ455 Thumbhole with Tasco scope and decided to try bench rest (well one sandbag and a chair). I had to tune in the sight's due to change of ammo; so my first 5 shot's were a walk in from the outer edge to the centre. Set up 3 target's, one each. My wife got highest score! Seem's that our daughter has inherited some of her talent. 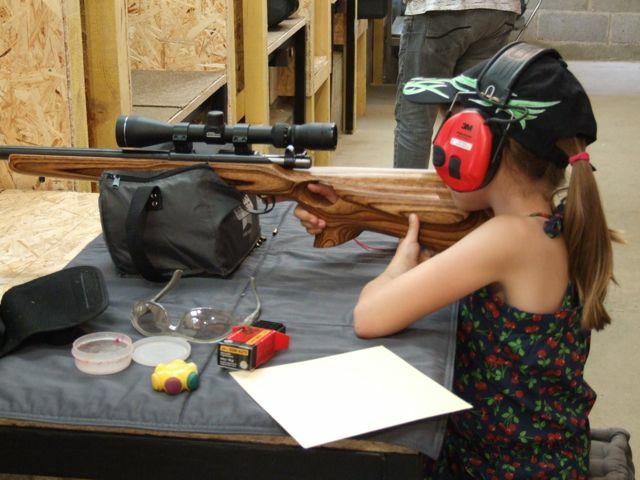 All the rifles are too big for my daughter, but this is a little easier for her than the No8. 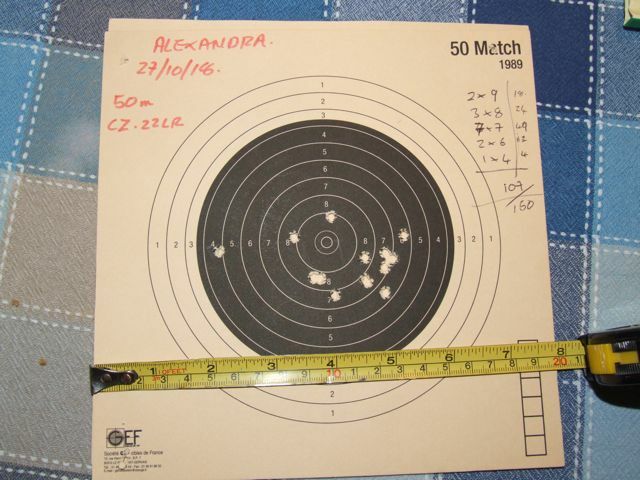 it was also the first time on target's at 50 metres. Very pleased with the result's. She has a problem closing her left (dominant) eye, so need to shade out some glasses to make it easier for her. 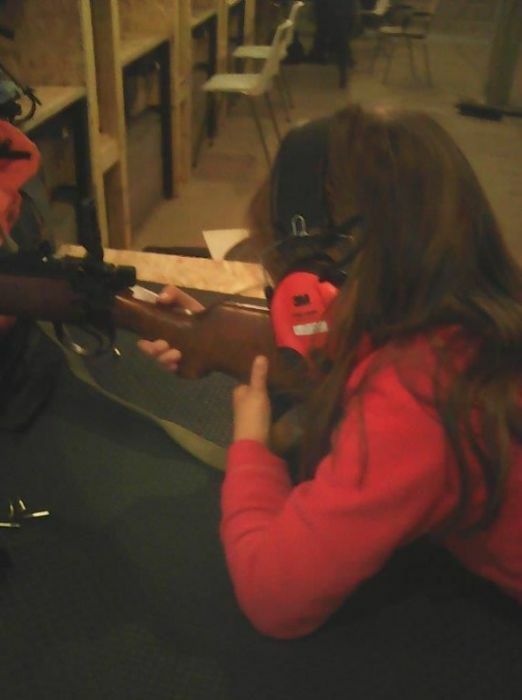 For a first rifle that's still way too big for her she did well. Are the child sized "Cricket" rifles available there? Get a pair of clip-on sunglasses & remove the right lens! That way she can just flip it up when not shooting! I love seeing these pictures, Zed. It takes me back to my childhood with my dad teaching me how to shoot. Those are treasured memories and I am certain your daughter will one day look back at these moments in the same fashion. using the sandbag rest. Quite a noticeable improvement over the first target in June. I remember those early days. Way to go teaching them early. I'm thinking that if more folks learned early about gun safety then we might have less problems in this world. Good to see young folks on the range.